The Old Capital Golf Club was originally founded as a nine-hole, member-owned golf course in 1946, known as the Corydon Country Club. 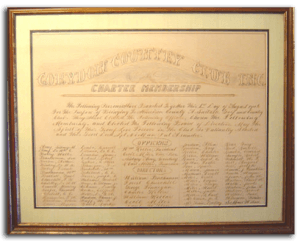 The charter members bought the land, built the clubhouse, course, and were responsible for maintaining the property. Golf carts made their debut at the Corydon Country Club in the mid-sixties — the first carts used at the course were one or two that were privately owned by members. Then the club board decided to purchase six golf carts and charge a fee for members to use them, disallowing the use of private carts. In 1995, the members purchased additional land, and added nine additional holes, making it an 18-hole, par-72 championship course. In 1998, the club was purchased by Douglas T. Breeden and Mark B. Wiseman — both long-time residents of the area — and was renamed the Old Capital Golf Club. (Dr. Breeden has since become the sole owner) The club retained a golf membership, with various levels and benefits available, but also opened the course to public play. The new owner devised a renovation plan for the 18-hole course to make the Old Capital Golf Club one of the best in Southern Indiana! Nine new holes were opened in July, 2000, and the remaining nine were opened June, 2001. Recent renovations have been completed on hole numbers 14, 8 and 9 as well as many new tees and landscaping. The current owner & management of Old Capital Golf Club are committed to providing outstanding service , state-of-the-art facilities and a great golf experience to all of our customers!